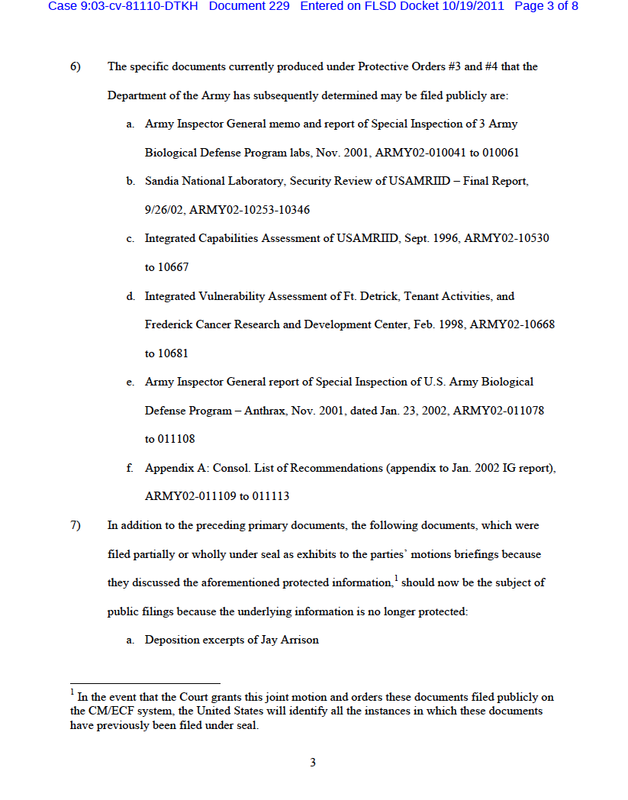 2011 October « CASE CLOSED … what really happened in the 2001 anthrax attacks? CASE CLOSED … what really happened in the 2001 anthrax attacks? * Lawsuit Letter Demands That FBI Release Wrongly Withheld Anthrax Case Documents. * CASE CLOSED - Lew's novel about the anthrax attacks and the failed FBI investigation - has been re-published. In this interview, Lew explains why perhaps his novel is closer to the truth than anything the FBI is asserting. * In the formal handwriting examination conducted in the Amerithrax investigation, it was concluded that "Bruce E. Ivins probably did not write the writings appearing on the 'anthrax' envelopes and letters." The Assistant US Attorney did not disclose that fact in the Amerithrax Investigative Summary. * continued withholding of documents by the FBI and National Academy of Sciences (NAS) ... hiding mistakes? hiding lies? surely hiding the truth! * The Al Hayat letter bombs involved lethal letters sent to newspapers in NYC and DC and symbolic targets relating to the WTC 1993 plotters. Were the Al Hayat letter bombs the model for the Amerithrax letters? Were the same people responsible? * Who told the reporter that RIID sent Ames to ATCC? * The Army decided yesterday that there was nothing that needed to be classified in the eight page section on Afghanistan from the IMCS! 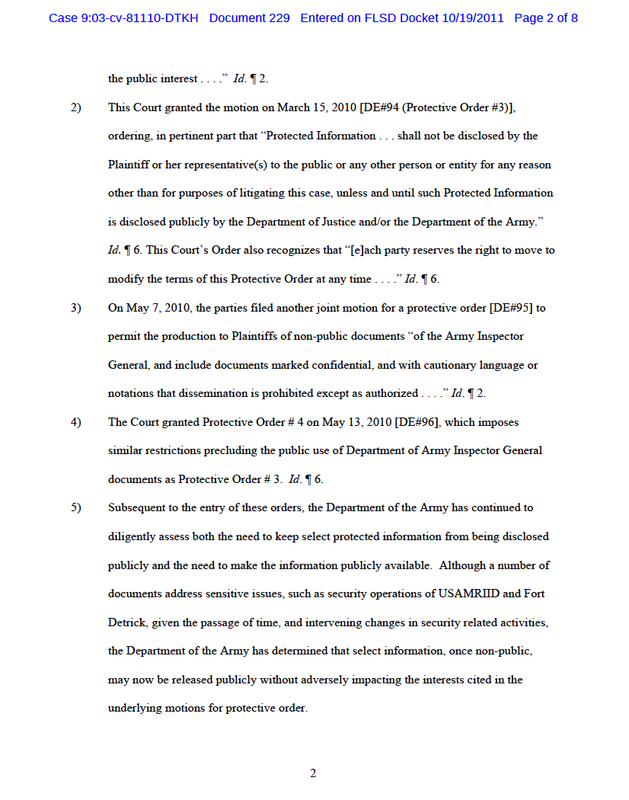 * When Is The Army Going To Process The Many Dozens Of Withheld Emails Awaiting Production? 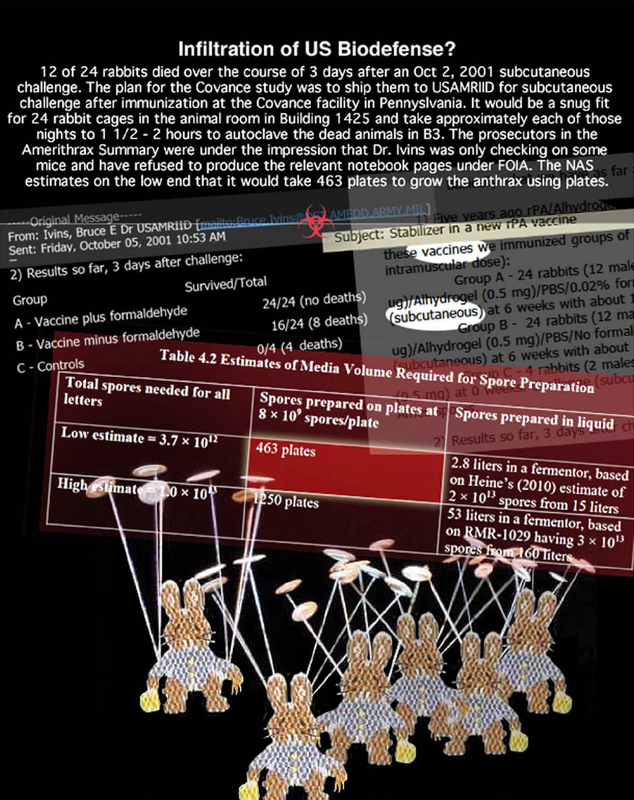 * In a long withheld and recently produced email to Mara Linscott, Ivins discusses work with Ames in Building 1412 (not 1425) and how they might have to someday do challenges of hundreds of rabbits for Bioport. 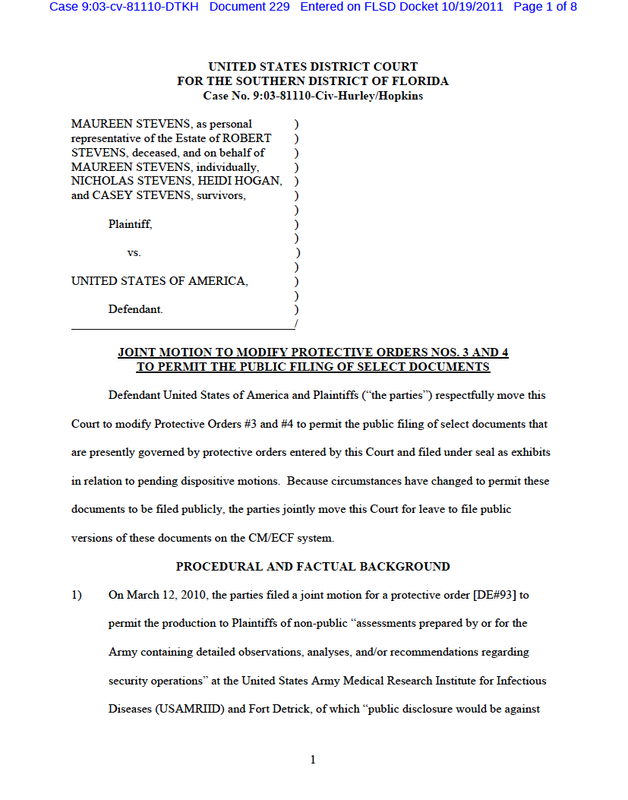 DXer on * Lawsuit Letter Demands That FBI Release Wrongly Withheld Anthrax Case Documents. DXer on * are hoax anthrax attacks one consequence of the FBI’s failure to solve the case? In a letter to the editor of The New York Times, a top FBI official today disputed recent reports by ProPublica, PBS’ “Frontline” and McClatchy that challenged evidence in the agency’s investigation of the 2001 anthrax letter attacks and its conclusion that Army scientist Bruce Ivins was the perpetrator. The letter from FBI Assistant Director for Public Affairs Michael P. Kortan followed editorials in The Times and The Washington Post that called for new, independent investigations into the anthrax case, which the FBI officially closed 18 months after Ivins committed suicide in the summer of 2008. Kortan’s letter largely repeats prior claims in defense of the case, some of which were covered in our stories. Ivins was a top anthrax researcher at the U.S. Army Research Institute of Infectious Diseases in Fort Detrick, Md. He produced vaccines and tested them on lab animals. The FBI has said a spike in Ivins’ nighttime lab hours before the mailings explains when he prepared the letters. What we reported: Ivins’ evening hours were above average just before the mailings, but lab access records also showed it was not unusual for Ivins to work late at other labs and offices throughout the Army complex. 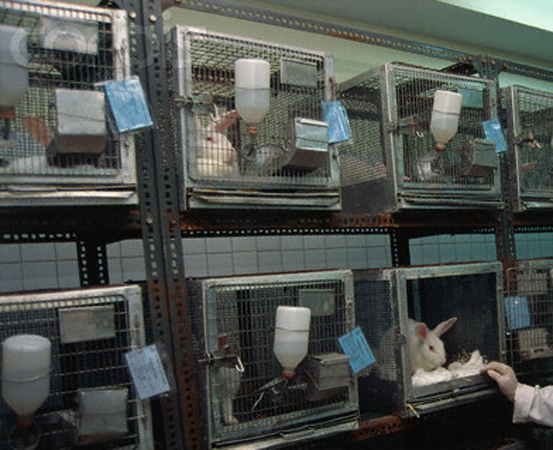 Further, Ivins’ colleagues said he was conducting animal experiments at the time. 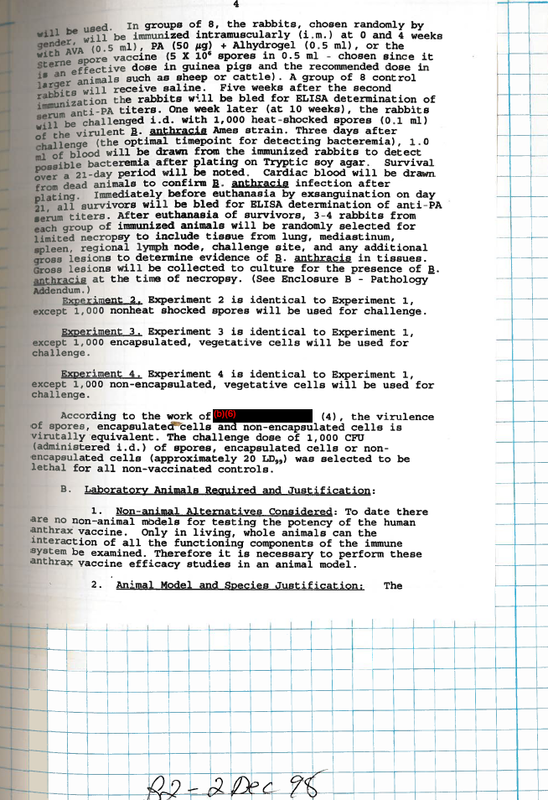 Once the FBI determined the letters contained a strain of anthrax common in labs, the bureau asked scientists to submit samples of their spores. The FBI has said Ivins tried to hide his guilt by sending a false sample from his spore collection. Genetic tests later showed the spores in Ivins’ flask – RMR-1029 – matched the letter spores. 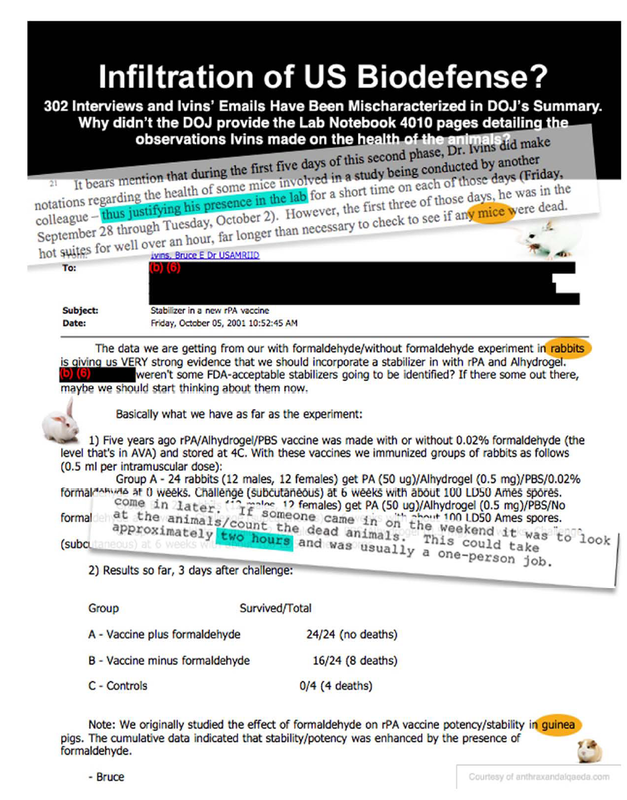 What we reported: An email shows that Ivins’ offered his spores for genetic tests in December 2001. Though samples he submitted from his flask in April 2002 were not a genetic match, Ivins maintained it was an innocent mistake. Furthermore, an FBI memo and Army document show that Ivins had given another sample of RMR-1029 to a different colleague around that time. 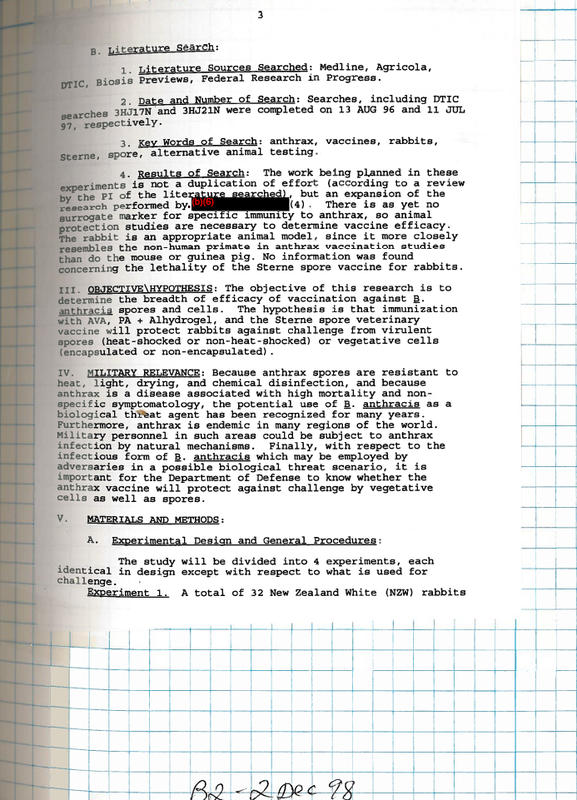 Email messages and lab notebooks show that two years later Ivins helped a colleague collect a sample of RMR-1029 specifically for FBI evidence. Finally, the very first sample Ivins gave the FBI in February 2002 was rejected because it was in the wrong type of test tube. It was later tracked down, and tests determined it to be a close match to the letter spores. FBI and other scientists who examined the attack spores found that they contained silicon, tin and some other elements. The presence of those elements fueled speculation that the spores were treated – weaponized – to make them more dispersible. The FBI has said its studies show the silicon was the result of a natural process. What we reported: A National Academy of Sciences committee that reviewed the investigation’s scientific findings concluded the unusually high amount of silicon measured in spores sent to the New York Post was unexplained – something the panel’s vice chairman, David A. Relman, told us remained a “big discrepancy” in the FBI case. * NPR’s John Dankowsky interviews Stephen Engleberg, Paul Keim and David Relman … RELMAN: the evidence linking the anthrax material in the letters to the material in the flask in Bruce Ivins’ lab was consistent with an association but was not conclusive or definitive … KEIM: there’s no scientific test that can prove that it came from Fort Detrick, Maryland. NPR, October 28, 2011 … Army microbiologist Bruce Ivins, the FBI’s prime suspect in the 2001 anthrax attacks, died before his trial in an apparent suicide, and the case is now closed. John Dankosky and guests discuss new investigations that question whether scientific evidence against Ivins was conclusive enough to hold up in court. JOHN DANKOSKY, host: Last year, the FBI and the Department of Justice closed the case, concluding that the late Dr. Ivins acted alone in executing the anthrax attacks. But how conclusive was the scientific evidence against Dr. Ivins? Several recent investigations, led in part by two of our next guests, have asked that question. And that’s what we’ll be talking about this hour. Now let me introduce our guests. Stephen Engleberg is a managing editor at ProPublica here in New York and a reporter on ProPublica’s anthrax series with McClatchy and PBS Frontline. Paul Keim is a microbiologist and evolutionary biologist at Northern Arizona University and at the Translational Genomics Research Institute in Flagstaff, Arizona. David Relman is professor of medicine and microbiology and immunology at Stanford. 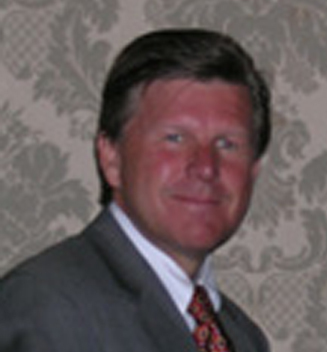 He’s also chief of infectious diseases at the VA Palo Alto Health Care System in Palo Alto. DANKOSKY: Dr. Relman, you were vice-chair of the National Academy’s panel that investigated how scientific evidence was handled in the anthrax case. What was that panel’s conclusion? And was the scientific evidence against Ivins as thorough or conclusive as has been described by the FBI? RELMAN: Well, first of all, we were asked to look at the scientific data and the conclusions that were drawn from it. We were not asked to comment upon or assess the probative value of the scientific data. but was not conclusive or definitive. DANKOSKY: … I’m wondering, Dr. Relman: How much of the investigation of Bruce Ivins, the main target of this investigation, how much of this was really based on science, and how much was based on other things? RELMAN: It’s an interesting question. It’s one that we really weren’t in a position to be able to answer. We were simply asked to look at the science. KEIM: And what our investigation found was that as the case was built, they became less and less interested in doing things that might undermine the case. … My guess – and here it’s just a guess – is that they didn’t want to ask a question they didn’t have the answer to. They were afraid it would show something unexpected. And I think for scientists, that’s exactly what you’d want to do, is find something unexpected. DANKOSKY: Dr. Relman, is it possible that there were key anthrax samples missing from the FBI repository from abroad, maybe from U.S. government labs? RELMAN: It’s possible. I think in any case like this, you’re always going to be confronted with the problem of knowing what is the true universe within which one needs to search. We were told of a certain set of samples, and there were a large number that were collected from all over the world. And yet we did become aware, for example, of some environmental samples that were collected overseas which gave inconsistent results in the presence of Ames anthrax. And these samples, because they didn’t yield a cultivated organism, never made their way into the repository, where the more formal, deliberate testing was undertaken. So that’s one bit of evidence or one indication that there may have been certain kinds of samples that never really made their way into the final repository. DANKOSKY: And the security, Stephen Engleberg, you reported on Dr. Ivins’ lab – very, very lax. ENGLEBERG: Yes, now in fairness, it has been significantly tightened since the case of the anthrax letters. But I think your caller’s point is well-taken. I did a book 10 years ago with Judith Miller and Bill Broad of the New York Times on this subject, and I was startled, as well, as to how easy it would be to do this. Now, you know, again, in this case what we’re talking about is supposedly is an insider who did it. But you can’t rule out other possibilities, because it is that easy. DANKOSKY: So we’ve talked a bit about the circumstantial evidence and some of the science. Dr. Keim, I’ll ask you first: Do you think, in the end, that the scientific evidence here was solid enough to go to court to charge Dr. Ivins? KEIM: Well, I can’t tell you whether it was enough to charge Dr. Ivins. I can only speak to the part of the investigation that I worked on, which was, really, the Ames strain. So I would have gone to court and I would have been able to say quite precisely that this was a strain that came from a laboratory. It was very unlikely that it would have come from nature. DANKOSKY: Dr. Relman, what do you think? Do you think that there was enough evidence to go to court? RELMAN: I don’t think we should be expecting that a scientific experiment is going to reveal a result that points to a person. It may point to a possible source or an evolutionary history or a set of relationships. KEIM: what we’re talking about is the question of whether or not a particular anthrax culture, the person who made the letters actually took this and grew it somewhere else. It’s not taken out of the flask and then dried. So they grew it someplace separately. Did that person take it from this particular flask? If so, there are well over 200 people who had access to this particular flask. But that’s not the end of the story, because this material, this very same material, was in other places. So, for example, to say that one of the research laboratories in Ohio did not contain the perpetrator, the FBI needed to look at those people and ask questions like: Did they have enough time to drive to the Princeton, New Jersey mailbox? And science can’t answer that question because it’s the same stuff. from Ohio or from Fort Detrick, Maryland. DANKOSKY: do you think that Dr. Ivins had the capability to produce these dry spores, the ones that ended up in the letters in such a high quantity? KEIM: I’m going to have to decline to answer that. I’m not a spore-production expert, and I, you know, really don’t know what Bruce had in his laboratory, and whether it would have been able to do that. That’s just beyond my area of expertise. DANKOSKY: David Relman, you want to weigh in? 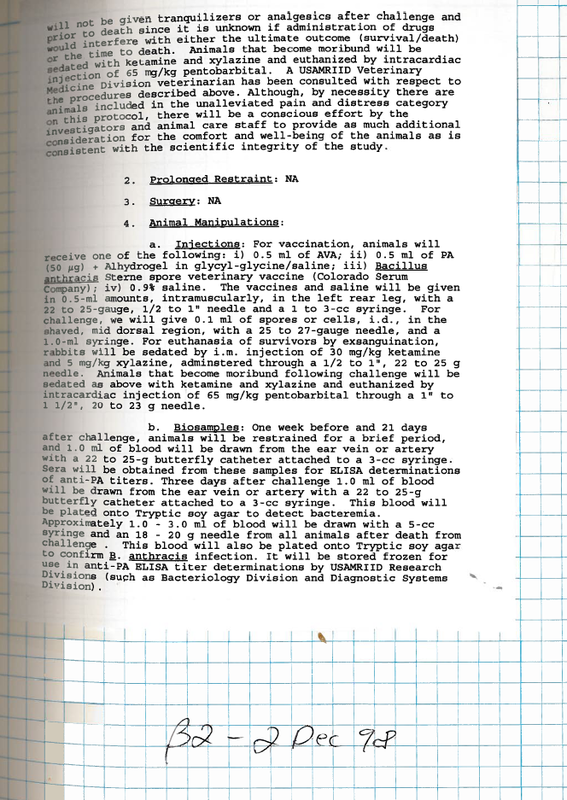 … do you think that this is even possible to do what Dr. Ivins had at his disposal? RELMAN: Well, you know, we actually were never presented with what we had at his disposal. And what there might have been at someone’s disposal in 2009 when we began our work could certainly have been something very different than what was at someone’s disposal in 2001. So there are a lot of unknowns. And we – and to be honest, we were not presented with a specific scenario, a set of resources and equipment and other reagents, you know, that might have been the, you know, the scenario through which these things were made. 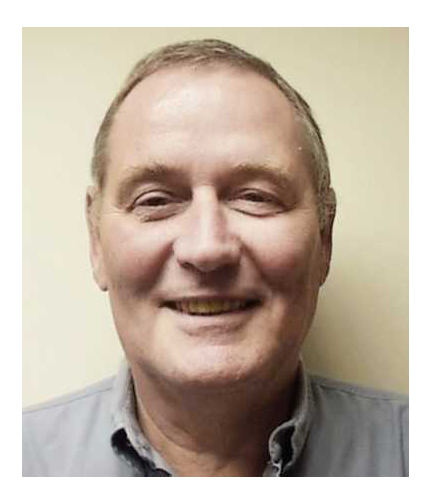 ENGLEBERG: Now, that said, if you interviewed Dr. Ivins’ colleagues at Fort Detrick, there are one or two who say he could have done it and a larger number who say he couldn’t have done it. And frankly, none of the people speaking are really truly expert in the area of spore cultivation. So having spent some time interviewing people on this, I would say that it’s still a difficult question to answer. A long-awaited trial that would have laid bare the federal government’s role in the deadly 2001 anthrax attacks and challenged the FBI’s claims that one madman acted alone won’t be held after-all. 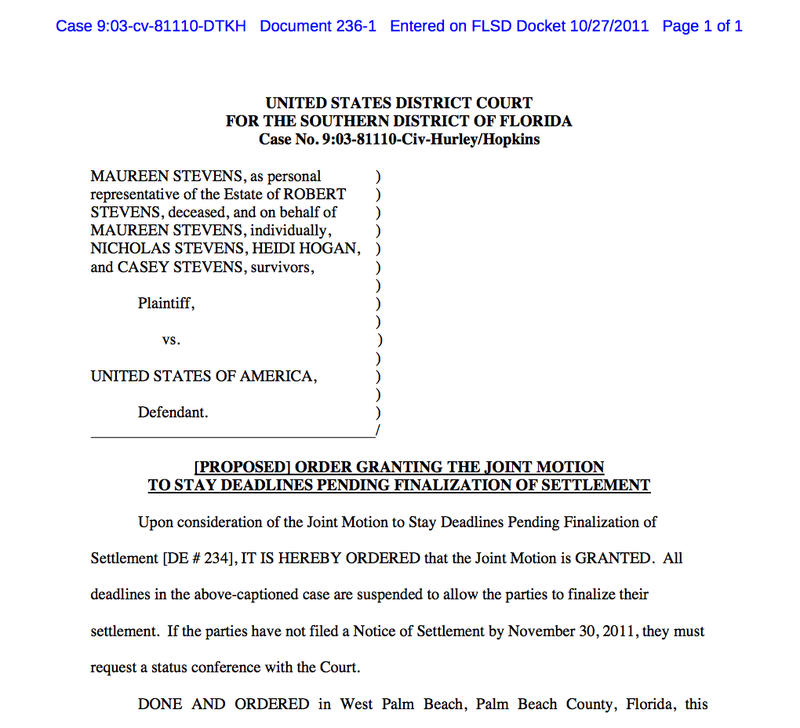 Lantana widow Maureen Stevens, who has spent 10 years trying to get federal officials to accept responsibility for the death of her husband and four others, has settled her $50 million lawsuit against the government, her lawyer confirmed today. Attorney Jason Weisser said he couldn’t divulge the terms of the settlement until it is formally approved by the U.S. Justice Department. The trial, he said, would have also tested the FBI’s much-criticized claims that the attacks were carried out solely by Bruce Ivins, a researcher at the U.S. Army Medical Research Institute of Infectious Diseases at Fort Detrick, Md. scientists testified that various people had access to the lab where Ivins allegedly produced the deadly compound. “We had people from Egypt, Poland, India, Iran, Latvia and China,” one former chief bacteriologist testified. Ivins’ former co-workers testified, he had neither the time, equipment or know-how to produce the deadly anthrax. Further, he said, it would have taken Ivins six months to a year, working almost full-time, to produce the deadly spores. Someone, he said, would have had to help him. Such conflicting testimony flummoxed government attorneys. They were trying to get the case thrown out, arguing that the government is not responsible for the actions of a rogue employee. However, in court filings that they ultimately redrafted and sealed, they, too, said some of the needed equipment wasn’t in the lab. 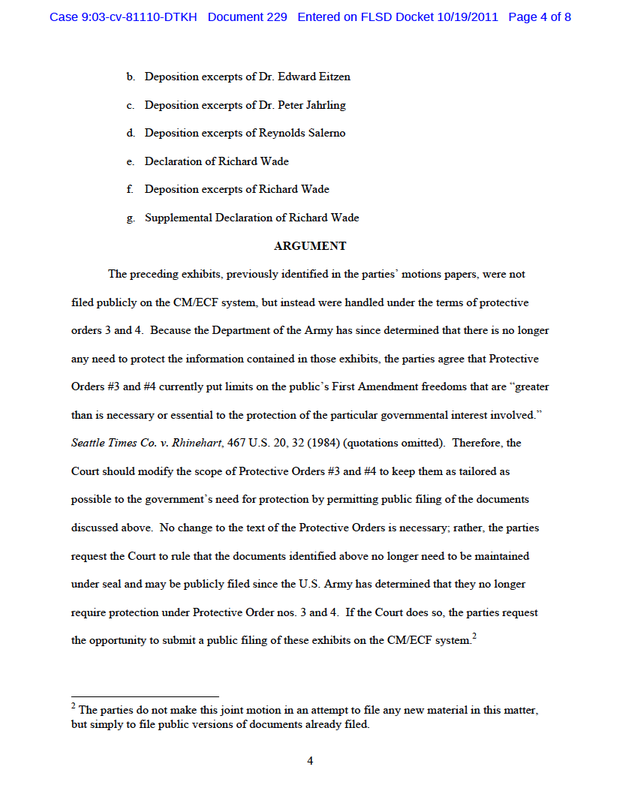 Further, U.S. District Judge Daniel T.K Hurley last week ordered that some protected documents about the lack of security at the institute, be filed publicly by Tuesday. * the FBI takes issue with the recent NYT editorial … wouldn’t you love to be able to have dialogue with Mr. Kortan on these issues instead of simply a repetition of the FBI’s unproven assertions … let’s hope FRONTLINE does exactly that !!! 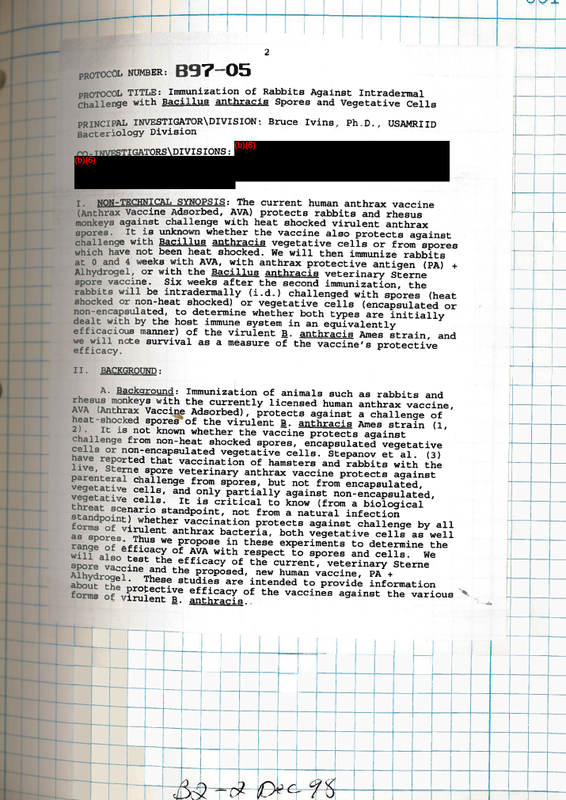 First, the National Academy of Sciences report concluded that the anthrax in the mailings was consistent with the anthrax produced in Dr. Bruce Ivins’s suite. The report stated, at the same time, that it was not possible to reach a definitive conclusion about the origins of the samples based on science alone. But investigators and prosecutors have long maintained that while science played a significant role, it was the totality of the investigative process that ultimately determined the outcome of the anthrax case. Further, scientists directly involved in the lengthy investigation into the anthrax mailings — both from within the F.B.I. and outside experts — disagree with the notion that the chemicals in the mailed anthrax suggest more sophisticated manufacturing. Second, it was directly relevant that Dr. Ivins worked long hours alone during the time of the mailings in the laboratory’s “hot suites” where the anthrax that was genetically linked to the attack spores was produced and handled. He had not done that before the mailings, nor did he ever do it again. Dr. Ivins submitted an intentionally misleading sample in April 2002 that was free of genetic markers. 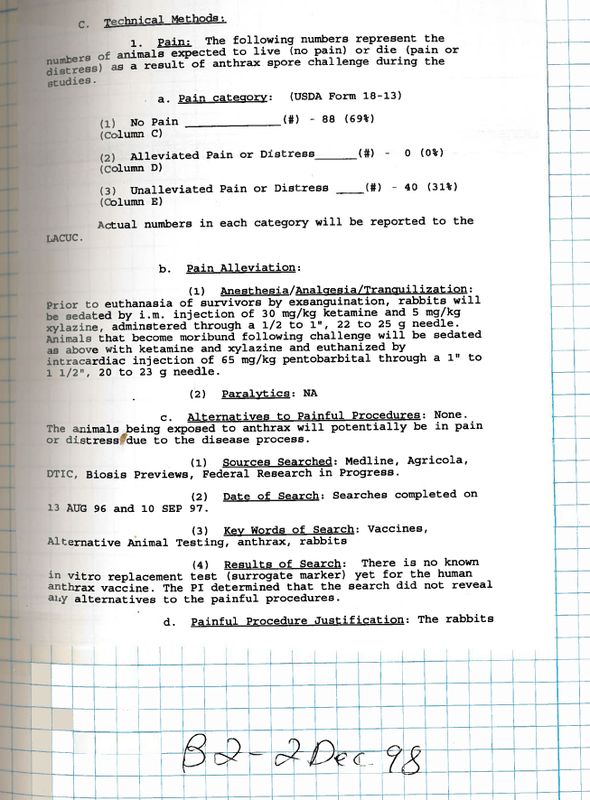 Samples of his anthrax spores that contained the genetic markers were either submitted before he realized the markers might trap him or were seized later by the F.B.I., not made available by Dr. Ivins. We strongly disagree with recent television reporting on this issue cited in the editorial. * FBI Assistant Director Kortan Should Be Asked Whether He Knows That Dr. Ivins On Those Nights Was Busy Autoclaving Dozens of Dead Rabbits — And If Not, Who Kept That Information From Him?